What’s more important than an Ergonomically setup workstation? 80% of jobs are now considered sedentary and there is only one direction this statistic is heading with technology and that’s up! But I see organisations spend millions each year on getting an allied health professional to conduct an individual ergonomic assessment. But what every ergonomic workstation assessment is missing is addressing the sedentary behaviour. So, what’s more important than your elbows at right angles and your screen at arm’s length away…. A PLAN TO MOVE! 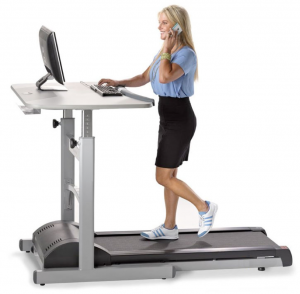 Exercise is at the key of sedentary based roles and sit to stand workstations aren’t the answer…find out more here about that stroke of marketing genius! BUT, education at a group and individual level should be the key of ergonomic assessments rather than trying to just make the best of a bad situation ensuring they are optimally setup in ultimately what is a bad posture (sitting). So yes, we agree that an allied health professional should ensure you are optimally set up at your workstation and you have the right equipment to support you, but that should only take 15 minutes. The rest of the assessment should be practical strategies to eliminate the sedentary behaviour and that’s by adding exercise that becomes habitual breaking static postures at your workstation without the impacting your productivity. Sound too good to be true, well that is exactly what Allied Fitness Australia has developed with the amazing skills and knowledge of our Exercise Physiologists; An Ergonomic Exercise Assessment & Program. 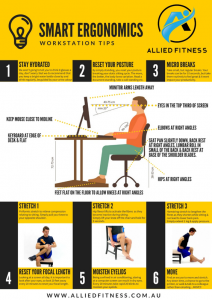 In this assessment, you or your team get an Ergonomically sound setup but also get a movement program to perform at their desk to break the sedentary and static cycle associated with working a desk. Now that’s what is going to prevent injuries and prevent the development of chronic diseases. If your workplace has tried these assessments before and not got the benefits, then you MUST try this assessment and program, or of it’s your first time then why not do it right the first time and don’t waste money on ineffective assessments that only put a blanket over the underlying issues rather that eliminating them… for all the safety nerds out there you will know that elimination is at the top of the hierarchy of control and administrative controls like training is at the bottom. So, by doing this assessment, just go right to the top and eliminate your risks! To obtain an obligation free proposal and quote, get in touch now. But for now, here are some smart tips as our gift to you!